Tracking auto sales movement is one avenue to forecasting trends in home sales volume. Willingness to purchase a car is historically indicative of the population’s likelihood of making other major purchases, specifically real estate. However, recent prolonged stagnation in home sales volume has caused a shift in this trend. As of December 2017, auto sales volume in California is slightly lower than one year earlier, continuing a declining trend over the past two years. Interest rates on auto loans have already risen in lock-step with the Federal Reserve’s (the Fed’s) recent increase in the short-term interest rate, putting downward pressure on the auto market. Meanwhile, the latest data for home sales volume in California shows sales volume is roughly the same as one year earlier, reflecting a long period of stagnation since 2008. High home prices, though slowing, remain a discouragement to homebuyers. Further, a continued lack of residential construction to meet homebuyer demand has severely halted home sales volume, causing auto and home sales trends to diverge. Home sales volume, and in turn prices, won’t rise substantially until 2019 in response to strong job growth and the Great Convergence of first-time homebuyers and Baby Boomers both moving on California’s housing market. Expect a delayed rise in home sales following auto sale increases when home construction finally rises to meet demand, and a similar decrease in auto sales when home sales eventually slow again. Updated January 10, 2018. Original copy released November 2012. Data courtesy of California Department of Finance (DOF), California Department of Motor Vehicles (DMV), Motorintelligence.com, and DataQuick. Editor’s note — This article uses “car” to refer to cars, trucks and other passenger vehicles. A question: based on your current financial situation and your knowledge of buying conditions, do you think now is a good time to buy a new car? That is, if you have a job and want a new car, would you be willing to take the final step and purchase one? How about a new home? If you hesitated about your ability to buy a car, you more than likely won’t be able to buy a new home in the near future. Willingness to purchase a car, one of the few “major purchases” common to most households (roughly equal in price to five months’ wages), has historically been indicative of the population’s likelihood of making other major purchases, specifically real estate (roughly equal in price to five years’ income). Or, as the case may be, “a driveway for every car.” Since the purchase of a car is less expensive than the purchase of a house, auto sales volume tends to rise earlier and fall later than home sales volume. For this reason, recent sales volume trends in this recovery stage for sales of cars indicate a volatile but increased willingness to buy a large dollar item and, potentially, increased home sales to come in the very near future. As the charts indicate, auto sales historically react to the economy in ways that complement and predict home sales activity in a recovery. The interplay between auto sales and home sales volume depends heavily upon the current economic cycle. When a recession or lesser economic slowdown looms, and buyers are less willing to make purchases, home sales volume tends to drop first while auto sales volume remains high for another year or so. For example, going into the 2008 recession auto sales peaked in August 2005, exactly 12 months after the peak in home sales volume. When home sales volume bottomed in January of 2008, auto sales followed to bottom 18 months later in July of 2009. Conversely, auto sales rise faster than home sales at the onset of a recovery, as experienced in 2012-2013 when auto sales were on an upward trend following the recession. 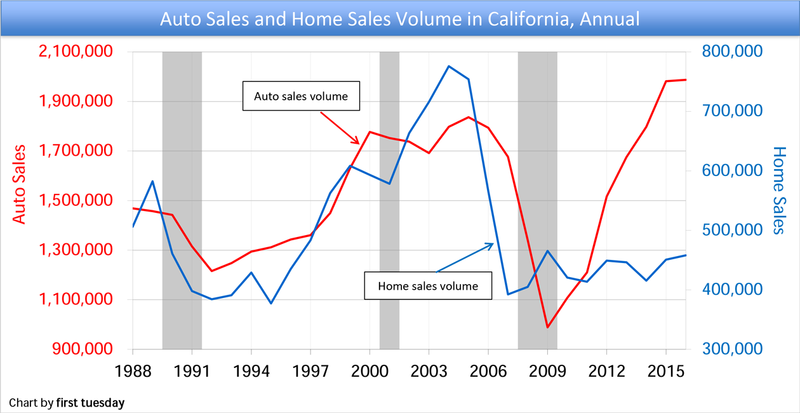 As Chart 2 shows, California auto sales also began a sustained rise in 1992 following the recession of 1990-1991. The rise in home sales followed haltingly over the next few years as the Federal Reserve (the Fed) fine tuned the level of the accelerating economy with rising interest rates. 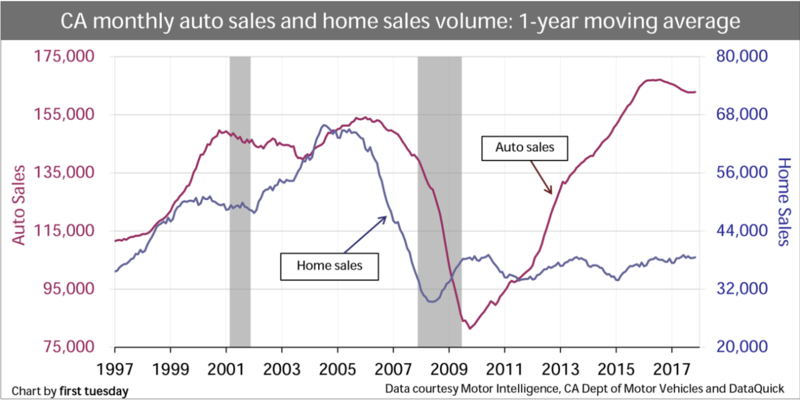 Home sales then raced to catch up with auto sales after the Fed-engineered slowdown of 1994-1995. Now, as 2018 begins, auto sales have slowed down in this bumpy plateau recovery, following the bounce spurred by the auto sales stimulus of 2009. Typically, home sales would experience a similar rise. However, as in 1993, we are currently in a period preceding a recovery, with interest rates and home sales still far below normal levels. Further, a severe lack of residential construction has stagnated home sales volume and caused a divergence from auto sales trends. Home sales will not rise as auto sales did until construction picks up to meet the current homebuyer demand. Looking forward, the pace of this recovery will follow first job increases (which have begun), then auto sales (reliable transportation to work), and then, in time, homeownership (final evidence of renewed confidence from a stable job and real estate market once inventory increases). While not as costly, cars bear a strong resemblance to houses from a financial perspective. Both are long-term investments, and both require significant debt for the typical purchaser. As such, these items are not bought casually; they require careful consideration of personal balance sheets, and calculations of usable assets and acceptable debt based on confidence in the future. Furthermore, unlike health care and (to a lesser degree) education — the other two “big expenses” — new cars and houses are tangible items whose purchase can often be postponed. Homeowners can stay in their current residence whether they rent or own; drivers can buy used cars, maintain old cars or shift to public transportation instead of buying new cars. In late 2006, the housing market went into a nosedive, with both sales volume and prices falling dramatically until they hit bottom in early 2008. In keeping with historic trends, auto sales volume began to decline about one year later, reaching its low point in 2008. Since 2008, the trough year in home sales volume, home sales have been on a bumpy plateau recovery path, showing strong fluctuations from half-year to half-year, but little long-term change in either volume or price. Meanwhile, auto sales volume is rising, in reaction to a slow but steady increase in employment. Auto sales have typically jumped at the end of a recession (recessions are marked with vertical gray bars on the charts). One such jump took place in late 2009, as buyers came to believe that the worst of the recession was over and short-term government subsidies encouraged new car purchases. Homes sales volume and prices followed, also urged on by one-off subsidies and, of course, the seemingly inevitable speculation, with similar short-term results: the dead cat bounce which followed the bursting of the millennium bubble. Although California auto sales volume has shown an overall upward trend since then, only at the start of 2012 did it approach the average of 139,000 cars sold monthly from 1996-2006. The delay was due to insufficient jobs, weak family incomes and excessive household debt. However, since then, auto sales have continued to rise – evidence the recovery is on its way. The chart’s measure of autos sold includes both outright purchases and leases. Auto leases are similar to ARM financing, in that they fuel an unsustainable (short-term) demand. Both ARMs and leases allow the owner to overreach, while at the end of the lease the owner is left with nothing. Further, after the ARM resets the owner is stuck making payments they very likely cannot afford. For most buyers, the decision of whether to make a major asset purchase — like a car or home — is a test of confidence. If buyers feel good about their own job and financial condition (that is, if they have not overspent/overencumbered their income flow), and are confident in the direction of the larger economy, they will be far more willing to put their savings and credit at risk to acquire a large asset. If not, they will delay purchasing and borrowing, and find an alternative (like renting). To assess the overall confidence of the population, we turn to the University of Michigan’s Survey of Consumer Sentiment. The survey asks questions about home and auto purchases. The responses to these questions reaffirm the connection between the two markets. As of Q3 2015, 66% of people surveyed nationwide said they thought it a good time to buy a car. This was up from 62% a year earlier, but well below the height of the boom in late 2004, when 75% thought it a good time to buy. In that same period, 79% said it was a good time to buy a home, also up from one year earlier when 76% thought it was a good time to buy a home. Of those who considered it a good time to buy a car, 51% specifically referenced either current low prices or low interest rates — both of which are major positive components of the current housing market as well. 76% of those who said it was a good time to buy a home referenced low prices or low interest rates. The majority of those who called it a bad time to buy said that vehicle prices are currently too high, to be expected in periods when wages and incomes do not keep pace with consumer inflation. Similarly, a number of respondents said they could not personally afford a car, citing the current economy and their own personal financial situations. The reason: families are currently deleveraging their balance sheets, reducing outstanding debt. They will continue to do so throughout upcoming years. Perhaps even more critical in the long-run, though not included in the University of Michigan survey, the younger generation seems to simply be growing disinterested both in cars and in homeownership. The same factors that have led to a decline in the popularity of suburban living among Generation Y (Gen Y) have also damaged the car-centered culture that supported it. Gen Y, the latest set of first-time homebuyers, may be willing to buy a car as a necessary form of transportation, but they are far less likely to invest in cars with the idealized significance that led to the muscle cars of the 1950s, 1960s and 1970s, or even the thriving American auto industry of the 1980s and 1990s. As with homeownership (or, more and more often, renting), economy and convenience are taking priority over romance. Auto sales jumped in 2013 and 2014, and continued to climb in 2015, rising to their highest levels since 2008. They have since declined. History leads us to anticipate that increases in auto sales volume will be followed by increases in home sales volume within one year, as newly-employed buyers take to the streets with long-overdue car purchases. This is because cars fall into obsolescence far more quickly than homes. 2012’s rise in auto sales volume was thus a good sign for real estate going in the second half of 2013. However, home sales ended 2013 roughly level with the prior year, and ended 2014 7% below 2013. This was due to speculator interference, which escalated home prices and dampened home sales volume. These high prices persisted in 2015, keeping sales volume persistently level-to-down. With these slow home sales, it is unlikely that a recovery phase in sales volume to end users (not speculators) will be possible before 2019. In the meantime, first tuesday expects volatile activity in auto sales, with both rises and falls from quarter to quarter. 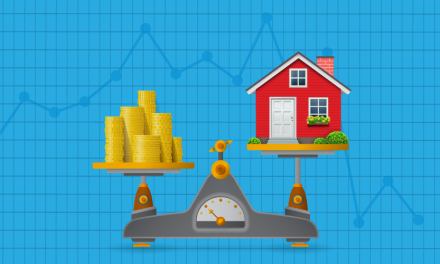 This condition lasted through 2014 into 2015, and is expected to be followed by more positive movement in home sales volume as potential buyers obtain stable jobs, consumers regain a measure of confidence in the economy and home constructions increases. Speculators and second home owners hoping for a new bubble-economy in the next few years, with skyrocketing sales volume and hyperinflated pricing, will be disappointed. The rate of consumer inflation will control home prices (and auto prices) for years to come. The declining interest rates experienced over the last 30 years are no longer available to do their asset-inflation magic. But those who plan to buy a home with a garage to park their new car will find many opportune moments and better informed agents to advise them on that purchase in the coming years. ” Investors, driven to near insanity by the Fed’s interest rate repression, have developed an insatiable lust for structured securities backed by subprime auto loans. OK, today’s subprime securitization rage is in the auto-loan sector, not mortgages. About 31% of all outstanding auto loan balances are rated subprime. They’re the foundation of booming auto sales. There is a lot to securitize. It’s so hot that private-equity firms are all over it. And IPOs are flying off the shelf.” etc. Car sales are up because people are leasing (renting) and flipping every few years not keeping them long term. So an ongoing car payment is not going to help the “tight” buyer save or qualify for a home!